Registration fees must be paid prior to event or onsite the day of event. Required for guest to attend the LRHA Awards Dinner. Be sure if you are bringing a guest to purchase a ticket. Registration for the LRHA Conference and Awards Program. Registration for the LRHA Conference and Awards Program and a 2020 Individual Membership (valued at $200). 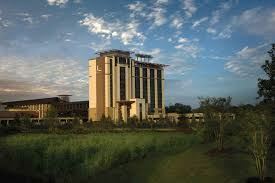 The LRHA has a special group rate of $119 + tax at the L'auberge Baton Rouge Hotel. The deadline to reserve a room under the group rate is October 13th. To make a reservation, call 866-261-7777, identify yourself as a member of the Louisiana Rural Health Association and/or use group code RLRHA19. You can also click here to make your reservation online by entering RLRHA19 as the Promo Code. To view important conference details, please click here. 2019 Rural Health Care Conference. Please see below the descriptions for all exhibitor registration categories. The base price is the cost of a 8x10 booth space and registration for 2 individuals. Additional guests at both will be an extra charge of $100 per guest. Second both representative will be entered as guest for this registration. This price is the cost of a 8x10 booth space.This option is for a booth registration with one additional booth representative. This registration will include 3 representatives at the booth. Other both representatives will be entered as a guest for this registration. This price is the cost of a 8x10 booth space.This option is for a booth registration with two additional booth representative. This registration will include 4 representatives at the booth. Other both representatives will be entered as a guest for this registration. This is for sponsorship of conference USB drive. LRHA will download all conference materials on USB as well as your company's information. LRHA will order USB with the logo you provide. Email logo to fontenot@lrha.org. To view Exhibitor information please click here.